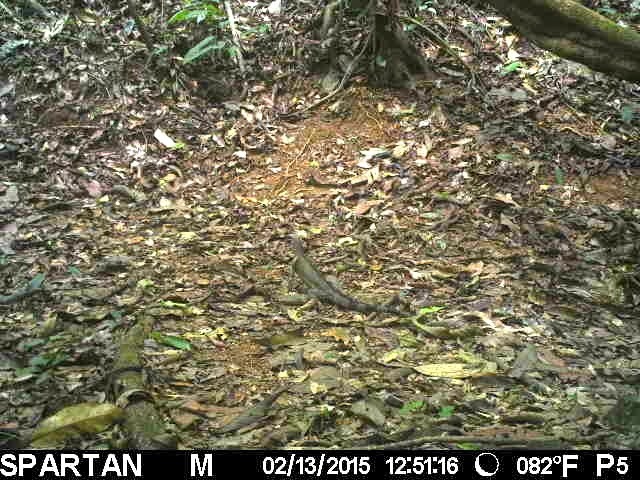 Ocho Verde Camera Trap Update: Hello and Happy 2015. Roi, aka Crooked Tail, with a big belly. We have big news to report about our project a little later in our update. We have just returned from Costa Rica where we downloaded nearly 9000 images and videos that had been recorded since late July. This many images is a bit out of whack for our time-frame, but we had 2 cameras that recorded continuously until the batteries died. One was due to a short due from high humidity, the other was due to a few blades of grass that popped up in front of the sensor and triggered it every time a breeze blew. We also had one camera that developed a corrupt memory card and sadly I could not download any of the photos. If you know of an easy way to retrieve them, send me an email and we can take a look at the images. Is a cub on the way, for Roi? On the animal front, we are seeing pretty much what we thought that we would. Crooked Tail(Roi) is still around as is her cub Pizza Slice. Crooked Tail has a bit of a saggy belly in the later pictures indicating that she may have given birth in the last few months. This would go along with the fact that we have seen far few male ocelots recently. Pregnant or parental female ocelots do not attract mates until the young are no longer with them. We are hoping to see her with a cub later this month. This blurry because a) it is from a video and b) Tayras are always on the move. Our macho male Tayra is still around, but this time he is with a companion...is love in the air? I had a chance encounter with the female in early January on a trail. She climbed a tree groaned at me to continue to back away, which I did. The Pacas seem to be abundant. The agoutis are common as they ever were at one point one occupied 350 of nearly 400 videos from a single camera. There are plenty of ant eaters. 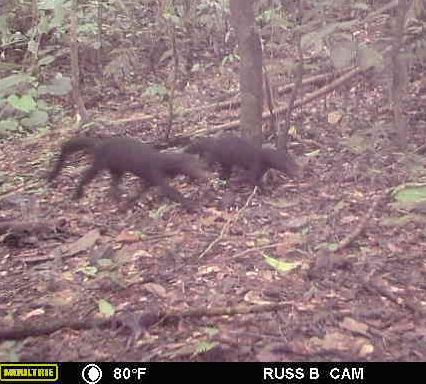 The Jaguarundi seem to be around as well although only singles were seen this past Fall. The Capuchin monkeys came down to several cameras and the coatis were seen at nearly every location. The hog-nosed striped skunk was seen more often and this may indicate him being more of a resident than passer by. The Curassows have been strutting around like they have owned the forest. One new animal that we had not seen was the 4 Eyed Opossum. It seems to have a little more bounce to it’s step that the larger Common Opossum. We had 9 cameras that failed and had to be returned to the states. One new Cuddeback camera failed 3 weeks into the new year. Ants caused a few of the failures and I believe that the rest was due to the humidity of extra rainfall in November. One camera was full of water from a bad seal, however, the images were just fine. The cameras were all brought back to the states for warranty repair(I hope). 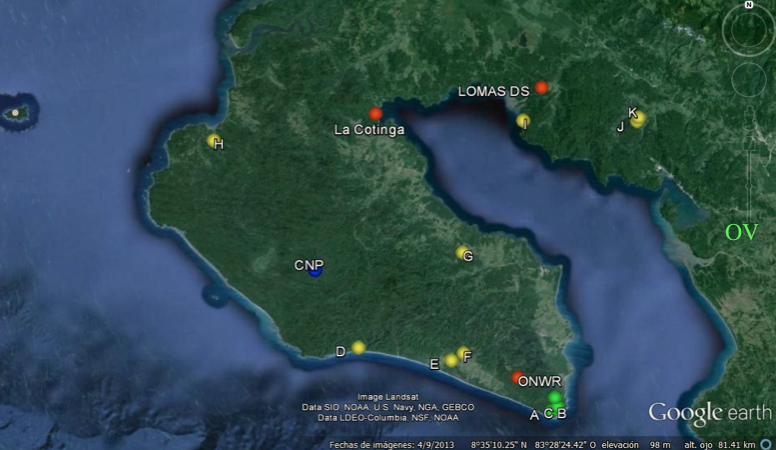 We are currently on the eastern edge of the network's boundary as it makes it way down towards Panama. We were also invited to share our data(nearly 30,000 images) with the MAPCOBIO Project which records biodiversity from camera trap projects from all over Costa Rica. In August, we received two Spartan wireless cameras, one from a private donor and one from the camera manufacturer HCO Scoutguard. With a month fiddling with the cameras, we finally had the cameras up and working. We are able to receive nearly instantaneous email images from our cameras. As we sat on the plane in Miami, this shot of an iguana dead center of the frame, appeared on my phone. I'm going to do a special blog on the 2 wireless Instant Wild cameras in the next week or two. I'll discuss some of the remarkable technology within these cameras.